A snow blizzard has hit Londonderry and there was also a report of lightning and thunder over the city shortly after 3:00p.m. The latest weather system over Londonderry comes at a time when the Met Office has upgraded a weather warning of snow and ice across Northern Ireland from yellow to amber. Templemore Sports Complex in Londonderry. The current weather warning is valid until 8:00a.m. on Wednesday. 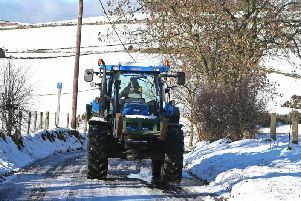 "Snow showers will be heavy and frequent through the rest of Tuesday, gradually easing off during the early hours of Wednesday, with a further slow improvement expected through Wednesday daytime, as showers become less heavy and less frequent," reads the amber weather warning on the Met Office website. "Some high ground is likely to see 15-25 cm building up, especially above 200-300 metres. At low levels throughout the warning area, 5-10 cm will be more typical. Showers will be accompanied by hail and lightning at times, while strong winds bring the potential for temporary blizzard conditions and drifting of lying snow, mainly over high ground."